I've never seen a zoog I want to play and this fella is no exception. These used to be safe while attached to domains but now agency have a couple of zoog hunting cards these little suckers will soon be extinct in your meta (if they weren't already). Doesn't do enough to justify its inclusion, plenty of attachments I'd rather have. Pretty terrible on its own, doesn't provide a faction for resourcing, and the ability is forgettable at best, useless at worst. Forget the Arcane icon. 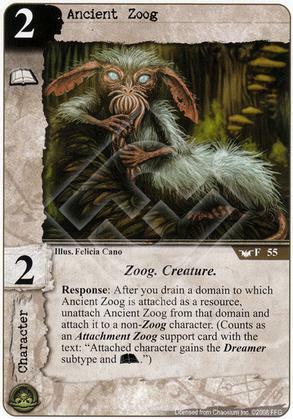 Adding the Dreamer subtype is where this card offers the most potential. Combined with Dream Dagger or Moon-Beast Galley, this card could have an impact. Also one more card to stack onto Overworked Bureaucrat, and it could be done as a surprise.